NASHVILLE, Tenn. (OSBORNE) -- Two big new development deals suggest investors continue to find Middle Tennessee an irresistible opportunity. 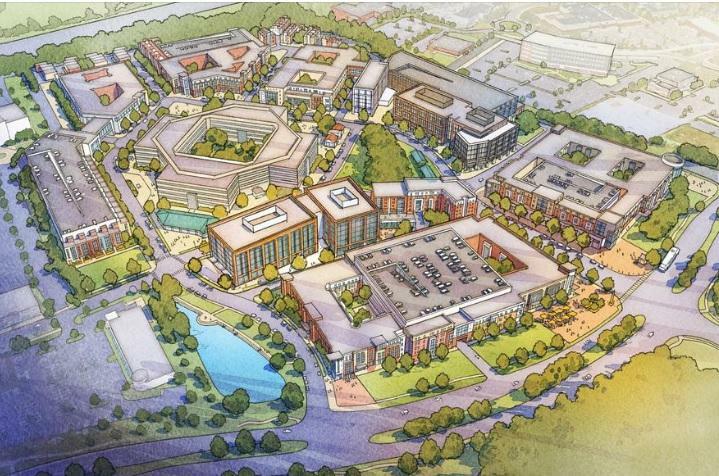 An artist's rendering of the East Works District project proposed for Cool Springs. Business reporter Adam Sichko says every time he thinks the mid-state can’t possibly reach any higher, new development deals raise the bar. Sichko recently reported on two such high-profile projects for the Nashville Business Journal. The first of two ventures is East Works District, a mixed used development in Cool Springs. Developers say the walkable community will include office buildings, residential structures, retail businesses, restaurants, hotels and green spaces. Sichko says the project is interesting, and the people behind the venture even more so. A second deal valued at $500 million is being proposed for the Nashville riverfront. An Atlanta based investor hopes to transform the former Nuehoff Packing Company slaughterhouse into a mixed use development. An old slaughterhouse might seem an unlikely candidate for redevelopment, but Sichko says several former industrial sites have been given new life in a similar fashion. Adam Sichko notes a real estate convention scheduled in Nashville later this month could generate even more interest in mid-state development. You'll find all of Adam Sichko's stories linked here.